A poor line change which directly led to a penalty as well as a pair of unanswered goals from the Big Ten’s leading goal-scorer in each of the last two seasons were just a little bit more than the underdog was prepared to deal with as the six-time NCAA national champion WISCONSIN BADGERS were able to fend off the brave but overmatched PENN STATE NITTANY LIONS 2-1 at the semifinal stage of the inaugural BIG TEN ICE HOCKEY TOURNAMNET. Wisconsin (23-10-2) had earned the right to bypass the quarterfinal round after finishing second in Big Ten Conference standings during the regular season whereas the previous evening Penn State (8-26-2) had seen the Nittany Lions skating against the Michigan Wolverines in an exciting tournament contest that almost made it to the halfway mark of the second overtime period, it certainly shall be noted here. Fatigued or not, it was the Nittany Lions who went to the lead after Canadian legionnaire CURTIS LOIK, the sophomore left wing from North Vancouver, British Columbia, did well to finish off a two-on-rush rougly a minute into the second period. Loik’s 7th strike of the season (which placed the 20-year-old in a tie for fourth place on the Penn State goal-scoring chart) was set up by a fabulous saucer pass from KENNY BROOKS, the versatile right wing from Las Vegas, Nevada, who was one of only four players to appear in all 36 of the Nittany Lions’ NCAA games during the 2013/14 NCAA campaign. It was Brooks who initiated the scoring movement with a fine defensive play in his own zone; an important touch by Canadian legionnaire DAVID GLEN, sent Brooks away down the right wing. Penn State Nittany Lions defenseman CONNOR VARLEY (2), the homegrown sophomore from Lansdale who has scored four goals in 56 NCAA games thus far in his collegiate career, battles with Wisconsin Badgers blueliner EDDIE WITTCHOW, the sophomore from Burnsville, Minnesota, who was the sixth round pick (# 154 overall) of the Florida Panthers at the 2011 National Hockey League Draft, during the Big Ten Conference tournament semifinal contest at the Xcel Energy Center in St. Paul, Minnesota. Wisconsin would not remain behind for long and equalized only 28 seconds later when center JEFFERSON DAHL sent a cross-ice pass to Badgers scoring ace MICHAEL MERSCH streaking in on the right wing. The senior from Park Ridge, Illinois, who led all Big Ten Conference skaters in goal-scoring the past two seasons in succession, skillfully shifted to his forehand and then powered the puck past Penn State netminder MATTHEW SKOFF. 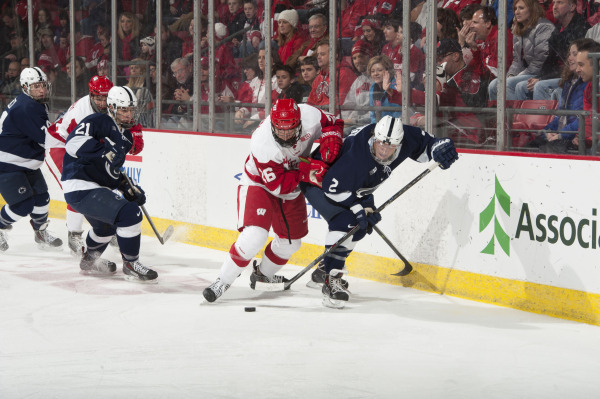 It was the 21st time that Mersch had lit the lamp this season but, unfortunately for the Nittany Lions, Wisconsin’s big gunner was only just getting started. Penn State were able to kill off a couple of penalties in the second period but a bad line change and subsequent bench minor with barely over a minute to skate before the final intermission would prove to be the Nittany Lions’ undoing. Wisconsin’s highly touted left wing NIC KERDILES, the second round selection (# 36 overall) of the Anaheim Ducks at the 2012 National Hockey League Draft who appeared with the United States national team at the 2014 IIHF World Junior Championships in Sweden this past winter, picked out Badgers center MARK ZENGERLE at the right side of the net and the Big Ten’s leader in assists this season quickly centered the puck to an unmarked Mersch in front. The scoreboard clock showed just 10.5 seconds remaining in the period when the fourth round choice (# 110 overall) of the Los Angeles Kings at the 2011 NHL Draft easily tallied his second goal of the contest. Penn State did have a couple of power play chances halfway through the third period but were only able to generate a combined total of two shots on goal during those two opportunities. 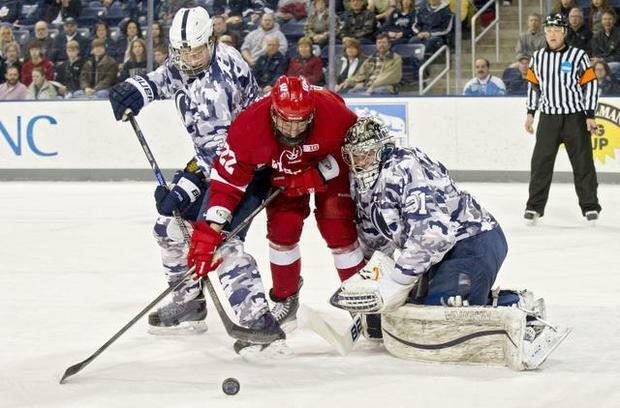 Wisconsin’s Canadian legionnaire JOEL RUMPEL, the undrafted junior netminder from Swift Current, Saskatchewan, had a solid outing and showed why he had been named as one of ten finalists for the prestigious Hobey Baker Memorial Award the previous day. Perhaps the Badgers’ best defensive exhibition of the evening came in the closing stages when both fabulous forechecking and deliberate puck possession from the Wisconsin trio of Kerdiles, Zengerle and right wing TYLER BARNES, the proverbial local boy from Eagan, Minnesota, prevented the Nittany Lions from removing their goaltender until only eight seconds were left in the contest. And, thus, out of the very first conference playoff tournament went number six seed Penn State — but not without a measure of honor. Wisconsin Badgers prolific right wing MICHAEL MERSCH (25) buries the centering pass from close range in the slot to score his second goal of the closely-contested Big Ten Conference tournament semifinal match-up with the underdog Penn State Nittany Lions at the Xcel Energy Center in the capital city of Minnesota. The decisive odd-man rush set up by the long stretch pass was finished off with aplomb only less than half a minute before the end of the overtime session as the # 5 ranked WISCONSIN BADGERS nipped the unlucky PENN STATE NITTANY LIONS 2-1 to complete the two-game Big Ten Conference weekend series sweep in State College. The frustrating loss did mark the tenth one-goal defeat for the second-year NCAA Division I program this season. 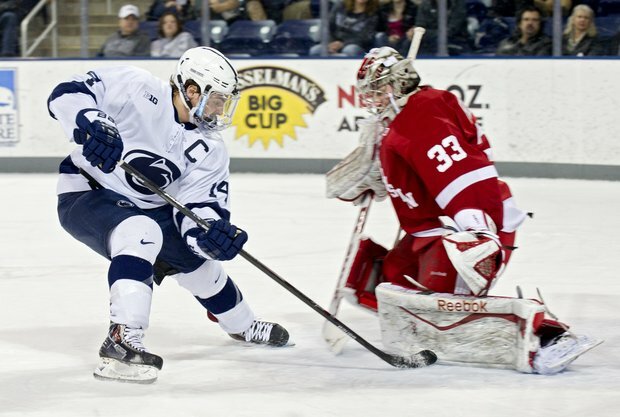 Resurgent Penn State right wing CASEY BAILEY (28 ga, 9 go, 12 pts), the 22-year-old sophomore from Anchorage, Alaska, who topped the fledgling Nittany Lions with 27 points (14 goals) in 27 games last season but had difficulty scoring during the first half of this 2013/14 campaign, continued his recent good run of form. Bailey, who netted twice for Penn State in as many contests with visiting Wisconsin this past weekend, has now snatched an impressive seven goals in the last eleven Big Ten Conference games for head coach GUY GADOWSKY’s side. Wisconsin center MARK ZENGERLE, the 24-year-old senior from Rochester, New York, who is the second-leading scorer (32 ga, 9 go, 27 as, 36 pts) in the Big Ten Conference this season, worked the one-two with exlposive linemate NIC KERDILES to absolute perfection after taking the long outlet from Badgers defenseman JOE FAUST, the 22-year-old senior from Bloomington, Minnesota, who was selected by the New Jersey Devils in the fourth round (# 114 overall) of the 2010 National Hockey League Draft. Kerdiles, the sophomore left wing from Irvine, California, who was chosen by the Anaheim Ducks in the second round (# 36 overall) of the 2012 NHL Draft and represented the United States at the 2014 IIHF World Junior Championships in Scandinavia earlier this term, also notched a shorthanded tally at the expense of Penn State on Saturday night, as well. 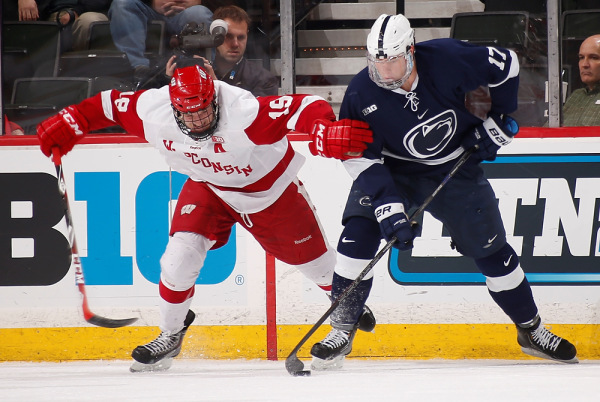 As genuine a “Nittany Lions Killer” as there was this season, not only did Kerdiles register one goal in all four of the Badgers’ games with Penn State this season, the skilled 20-year-old added six assists for a most impressive total of ten points. Wisconsin’s imported Canadian right wing JEDD SOLEWAY (22), the luckless 19-year-old freshman from Vernon, British Columbia, who was chosen by the Phoenix Coyotes in the seventh round (# 193 overall) of the 2013 National Hockey League Draft last summer but remains in search of his first collegiate goal for the Badgers this term, barges into Penn State netminder MATTHEW SKOFF (31) during Saturday night’s Big Ten Conference tilt at the Pegula Ice Arena in State College. Wisconsin center MARK ZENGERLE (9), the 24-year-old senior from Rochester, New York, who rocketed into second place on the Big Ten Conference scoring chart by totaling six points in two games against Penn State this weekend, celebrates after netting the game-winning goal in overtime that allowed the visiting Badgers to upend the host Nittany Lions at the Pegula Ice Arena in State College on Saturday night. After scoring three times unanswered over the first half of the contest, the complacent visitors were forced to hang on for dear life once the hosts had almost hauled themselves level with two goals in the final eight minutes but, ultimately, the # 5 ranked WISCONSIN BADGERS were finally able to fend off the late-charging PENN STATE NITTANY LIONS 4-2 in the the Big Ten Conference series opener on Friday night. Both NIC KERDILES, the talented sophomore left wing from Irvine, California, who was the second round choice (# 36 overall) of the Anaheim Ducks at the 2012 National Hockey League Draft, and playmaking center MARK ZENGERLE, the 24-year-old senior from Rochester, New York, had four-point efforts after each totaling a goal and three assists in the Badgers’ triumph over the Nittany Lions. Prolific right wing MICHAEL MERSCH, the 21-year-old senior from Park Ridge, Illinois, who was selected by the Los Angeles Kings in the fourth round (# 110 overall) of the 2011 NHL Draft, started the ball rolling for Wisconsin by scoring his 20th goal of this 2013/14 NCAA season less than five minutes in. First line right wing TYLER BARNES, the 24-year-old senior from Eagan, Minnesota, also bulged the back of Penn State’s net on behalf of the guests. Performing behind what continues to be a depleted defensive corps, Penn State netminder P.J. MUSICO (6 ga, 4.11 avg, .875 svpct), the 23-year-old junior from Orange, California, who began this term listed as third-string on the Nittany Lions depth chart, made thirty saves in what was just his second start of the current campaign. Penn State center TAYLOR HOLSTROM (28), the 23-year-old redshirt junior from Yorba Linda, California, who is one of the Nittany Lions’ remaining handful of “club hockey veterans” who made the mighty leap up to the NCAA Division I level two seasons ago, seeks to skate around Wisconsin Badgers defenseman FRANKIE SIMONELLI (27), the reliable 21-year-old senior from Bensenville, Illinois, during Friday night’s Big Ten Conference clash at the sold out Pegula Ice Arena in State College. Penn State skipper TOMMY OLCZYK (14) is thwarted by Wisconsin’s Canadian import JOEL RUMPEL (33), the 22-year-old junior from Swift Current, Saskatchewan, who is a rather serious candidate to win the inaugural Mike Richter Award that will be presented to the player selected as the standout goaltender in all of NCAA men’s ice hockey during the 2014 Frozen Four tournament in Philadelphia later this spring. The visitors did well to bounce back strong the night after enduring a landslide defeat but yet another costly turnover paved the way for a late game-winner from a fairly highly rated National Hockey League prospect as # 17 ranked WISCONSIN nipped underdog PENN STATE 4-3 to complete the two-game sweep in the first Big Ten Conference series ever played at the Kohl Center. One day after conceding a school record seven goals to their hosts in Madison, the Nittany Lions took the opportunity to prove their mettle by striking first on the power play less than seven minutes into Saturday night’s return encounter. Right wing ERIC SCHEID appeared at the back door and netted his 7th goal of this season after good build-up work involving the new, all-Canadian legionnaire defense pairing of LUKE JUHA, the sophomore from Mississauga, Ontario, who leads all Penn State rearguards this term with both four goals and nine points in thirteen NCAA games, and MIKE WILLIAMSON, the freshman from Leduc, Alberta, who was the fifth round choice (# 175 overall) of the Vancouver Canucks at the 2013 National Hockey League Draft this past summer. It is interesting to note that Scheid, the redshirt sophomore from Blaine, Minnesota, who has been a real bright spot on the attack for the struggling Nittany Lions’ offense this fall, scored a total of six goals while skating in 30 NCAA games for the University of Alaska – Anchorage as a freshman two seasons ago. The Badgers did not remain behind on the scoreboard very long before getting an equalizer from an unexpected source, however. Lunchpail right wing SEAN LITTLE, the homegrown season from Fond du Lac, took a pass in the high slot from center JEFFERSON DAHL, the homegrown senior from Eau Claire, and beat Penn State netminder MATTHEW SKOFF to score his very first goal of this season at the at the 10:14 mark of the opening period. But the Nittany Lions did manage to make it to the first intermission skating on level terms, which, given the result the night before, was a victory in itself and foreshadowed how the rest of this particular contest would, for the most part, conspire to play out. University of Wisconsin supporters hold up a banner to kindly let Nittany Lions starting goaltender MATTHEW SKOFF (31) know exactly how they feel about the ability of the sophomore from McKees Rock, Pennsylvania, to effectively stop pucks from entering the net during the very first official Big Ten Conference men’s ice hockey series ever held at the Kohl Center in Madison. 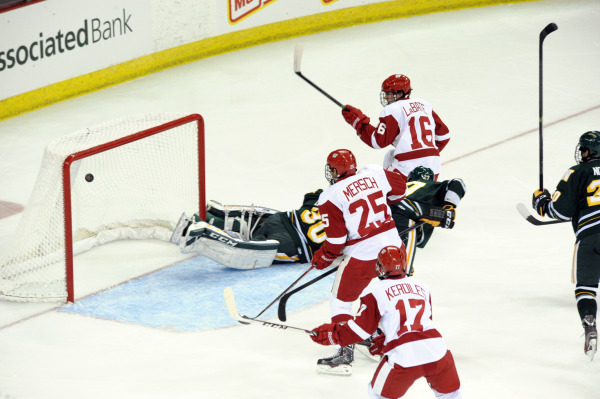 Senior right wing MICHAEL MERSCH, the fourth round selection (# 110 overall) of the Los Angeles Kings at the 2011 NHL Draft and unofficial goal-scoring leader in the Big Ten Conference last season, sent Wisconsin ahead for the first time all night with a tally on the man advantage six minutes into the second period. The Nittany Lions had already done well to kill of four power plays before the Badgers found success with a fifth after center RICKY DEROSA, the homegrown freshman from Aston who has not only established himself as a regular in the Penn State line-up after sitting out the first two games of this season but has also emerged as one of the team’s leading scorers since, took a penalty for elbowing. DeRosa would make full amends rather quickly, however and surprised the home crowd of 10,079 spectators by scoring his third goal of this 2013/14 campaign a couple of minutes after the halfway point of the contest had passed. Wisconsin went back to the lead seven minutes into the third period after defenseman JOE FAUST, the senior from Bloomington, Minnesota, who was nabbed in the fourth round (# 114 overall) of the 2010 NHL Draft by the New Jersey Devils, blasted a shot from the right point past an at least partially screened Skoff to register his first goal of this term. The blue-collar Little, who had zero points in ten NCAA games this fall before notching three points in the two-game weekend series with the Nittany Lions, made the play happen by landing a big hit on Penn State defenseman CONNOR VARLEY, the homegrown sophomore from Lansdale, and stealing the puck in the corner. Once again, though, the never-say-die Nittany Lions would come roaring back to knot the game, within the next 42 seconds to be precise. Freshman ZACH SAAR, the humongous (6’4″ 235 lbs) right wing from Richland, Michigan, did very well to shoot his second collegiate goal for the visitors despite his body being a bit off-balance and give the Wisconsin fans at the Kohl Center good reason to worry. But then Badgers center NIC KERDILES, the talented sophomore from Irvine, California, who was picked in the second round pick (# 36 overall) of the 2012 NHL Draft by the in-state Anaheim Ducks, allayed those fears with a fine piece of individual skill with a little more than eight minutes remaining. Kerdiles calmly faked a shot first in the slot before going top shelf to celebrate his seventh goal already this season. No luck once again for slumping Penn State (3-9-1), who have now lost four of their last five games against nationally ranked opponents by exactly one goal. Wisconsin defenseman JOE FAUST, the experienced senior from the Land of 10,000 Lakes who totaled a combined four goals and four assists in 99 NCAA games over the course of his first three campaigns with the Badgers, is enjoying a career year, offensively speaking, already having posted totals of one goal and seven assists in a dozen contests for the six-time NCAA national champions so far this season. University of Wisconsin center NIC KERDILES (17), the skillful sophomore who is now level with linemate MICHAEL MERSCH (25) for the Badgers’ scoring leadership on fourteen points after a dozen NCAA contests this term, pumps his fist moments after scoring the what turned out the be the game-winning goal against visiting Penn State late in the third period on Saturday night during the first official Big Ten Conference men’s ice hockey series ever played at the Kohl Center in Madison. Playing like a team absolutely possessed with the idea of extracting revenge for a humiliating defeat on home ice suffered last season, the local side took control once and for all with an overwhelming second period and benefited from goals scored by seven different players as # 17 ranked WISCONSIN blasted visting PENN STATE 7-1 in the very first official Big Ten Conference game ever held at the Kohl Center in Madison. In fact, the determined Badgers served immediate notice of their intent by firing their first two pucks officially on target past Penn State goaltender MATTHEW SKOFF, the homegrown sophomore from McKees Rock who had starred in the Nittany Lions’ 3-2 overtime triumph at the Kohl Center just nine months ago in his one and only appearance against Wisconsin of his rookie NCAA season, within the first four minutes of their Big Ten home opener. Penn State, who have been playing a much higher quality of hockey as of late despite coming into this historic contest with Wisconsin having lost their last four games on the trot, were able to half the deficit almost eleven minutes in. Captain TOMMY OLCZYK took a fabulous feed in between the faceoff circles and ripped a one-timer past Badgers goaltender JOEL RUMPEL, the junior from Swift Current, Saskatchewan, who had shutout Penn State in his one and only appearance against the Nittany Lions last term, to celebrate his third goal of this 2013/14 season. Olczyk, the junior left wing from Long Grove, Illinois, who has always stood out for his hard work with the penalty killing unit, netted three goals in 24 NCAA games for Penn State all of last season. Wisconsin left wing GRANT BESSE (21), the highly-touted freshman who was named the State of Minnesota’s high school hockey player of the year and then snapped up by the Anaheim Ducks in the fifth round (# 147 overall) of the 2013 National Hockey League Draft last summer, scored his fourth goal of this current NCAA campaign a little less than three minutes into the landmark Big Ten Conference clash with visiting Penn State at the Kohl Center in Madison. The fourth Wisconsin goal almost nine minutes into the middle frame certainly was a fantastic piece of both ice hockey intelligence as well as physical skill combined. Badgers center TYLER BARNES took a pass from left wing JOSEPH LABATE on the backhand at the side of the Nittany Lions net knowing that the Penn State goaltender Skoff was now just a bit out of position, if only for the moment. So the junior from Burnsville High School in Minnesota, with his back to the cage, quickly backhanded the puck between his legs to “simply” score his fourth goal of this season. Led by LaBate, the fourth round choice (# 101 overall) of the Vancouver Canucks at the 2011 National Hockey League Draft who ended this night with three assists, Wisconsin were not content to merely kill the clock in the final period. Badgers first line center NIC KERDILES, the sophomore from Irvine, California, who was the second round pick (# 36 overall) of the in-state Anaheim Ducks at the 2012 NHL Draft, chased Skoff after notching his seventh goal of this current campaign with less than seven and a half minutes to play. 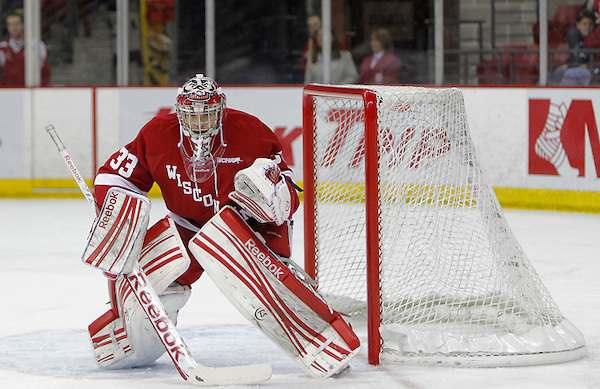 Wisconsin then proceeded to pump two goals past Nittany Lions replacement netminder P.J. SKOFF, the junior from Orange, California, who was making his first appearance of this 2013/14 season. 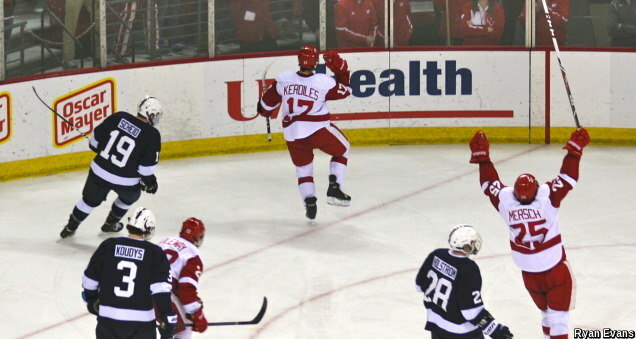 The seven goals by the rampant Badgers broke the Penn State school record for most goals allowed in any one contest, with the previous standard having been established when Robert Morris University blanked the Nittany Lions 6-0 in the first game of the 2012 Three Rivers Classic at the Consol Energy Center in Pittsburgh during the Christmas holiday season a year ago. University of Wisconsin right wing MICHAEL MERSCH (25), the fourth round choice (# 110 overall) of the Los Angeles Kings at the 2011 NHL Draft who struck for the seventh time this season while scoring his 51st career NCAA goal on Friday night, is confronted by Penn State defenseman DAVID THOMPSON (22), the homegrown freshman from Glen Mills who has established himself as a regular on the Nittany Lions’ blue line, during the second period of the very first official Big Ten Conference men’s ice hockey match ever hosted by the Kohl Center in Madison. Having totaled three goals and seven assists in his team’s first ten games to start this 2013/14 NCAA season, talented Wisconsin Badgers rearguard JAKE MCCABE (19) has already done much to confirm his status as not only one of the best defenseman in the new Big Ten Conference but, indeed, all of American college ice hockey, itself. While the UNIVERSITY of WISCONSIN do have a fleet of experienced and talented forwards to power an offense capable of scoring a good number of goals, the simple fact of the matter is that is, indeed, the defense (even more specifically, the goaltending) that will determine what exactly level of success the traditionally very strong Badgers program directed by veteran head coach MIKE EAVES will be reaching this term. Anchoring the Wisconsin Badgers blueline corps this season is JAKE MCCABE, the well-regarded defenseman who was selected by the Buffalo Sabres in the second round (# 44 overall) of the 2011 National Hockey League Draft. Last winter, the homegrown junior from Eau Claire not only served as the captain of the United States squad which surprisingly won the gold medal at the 2013 IIHF World Junior Championships but, on the strength of his quality performance at the annual event (7 games, 3 goals, 6 points, + 9 defensive rating), held on this occasion in the Russian city of Ufa, was voted to the official tournament All-Star team by the accredited media. As for the collegiate campaign last season, McCabe paced all Wisconsin rearguards with both 18 assists (which tied for third among all Badger players) as well as 21 points from 38 NCAA games. 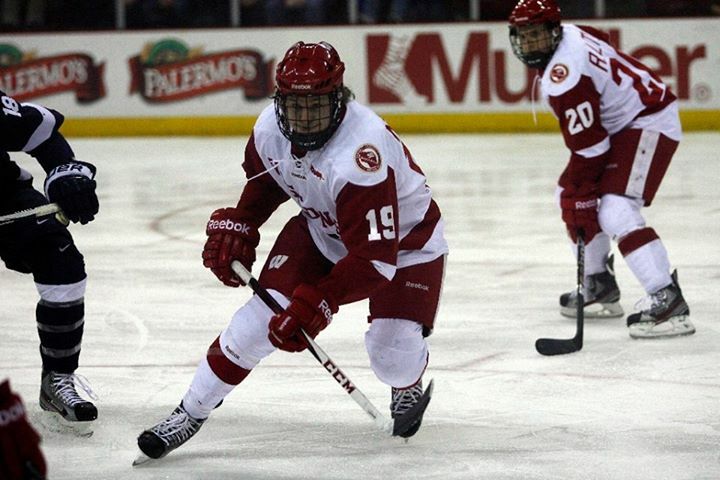 FRANKIE SIMONELLI, the undrafted senior from Bensenville, Illinois, who scored 10 goals in 118 NCAA games during this first three varsity seasons for the Badgers, comprises the other half of Wisconsin’s top defense pairing. It was the seasoned Simonelli who tied for second among all Wisconsin players by registering a + 18 defensive rating last term. Now wearing the captain’s “C” on his sweater, an inspired Simonelli has already bulged the back of the net twice inside the Badgers’ first ten games to begin this new 2013/14 campaign. Undersized defenseman KEVIN SCHULZE (5’10″ 165 lbs), the undrafted sophomore from White Bear Lake, Minnesota, led all Wisconsin players by posting a plus/minus rating of + 21 last season and forms the Badgers’ second blueline tandem with senior JOE FAUST, the quintessential stay-at-home defenseman from Bloomington, Minnesota. Faust has gotten himself more involved in the attack this fall, it should be noted. After recording just eight points (four goals) in 99 NCAA games during his first three years at Wisconsin, the fourth round choice (# 114 overall) of the New Jersey Devils at the 2010 NHL Draft has already racked up seven assists in the Badgers’ first ten games on the schedule at hand. EDDIE WITTCHOW is not only a third contemporary Wisconsin defenseman to have been drafted by a National Hockey League club (Florida Panthers, fourth round, # 154 overall in 2011) but the 20-year-old sophomore is also a third skater on this year’s Badger squad hailing from Burnsville, Minnesota. The clear first choice for Wisconsin in between the pipes has to be Canadian legionnaire JOEL RUMPEL, the undrafted junior from Swift Current, Saskatchewan, who appeared in 29 games (1.96 avg, .929 save percentage) last season and shutout Penn State in the very first ever NCAA varsity game contested between the Badgers and the Nittany Lions. However, on account of injury, Rumpel has only been able to start just three of Wisconsin’s first ten games this fall. The 22-year-old’s absence earlier this term was, perhaps, most noticeable on the disastrous road trip to New England, where the Badgers were completely trounced on consecutive nights by both Boston College (9-2) as well as Boston University (7-3) in Beantown. University of Wisconsin shot-stopper JOEL RUMPEL (33) appeared in 55 of the Badgers’ 79 games over the course of his first two seasons playing college ice hockey in the United States. During that period, Rumpel has been credited with an overall record of 28 wins against 21 losses with six ties while registering a goals-against-average of 2.20 along with a .924 save percentage. In that exact same time span, the Badgers have sported a mark of 11 wins against 10 losses with three ties when the Canadian legionnaire is not the goaltender of record. The proud WISCONSIN BADGERS, who have officially celebrated the NCAA national championship for men’s ice hockey six times altogether in school history, lost hardly anybody of great significance from the 2012/13 squad which claimed the very last Broadmoor Trophy ever presented to the winner of the annual WCHA Conference tournament and finished with the overall record of 22 victories against 13 defeats with seven ties. All of the main offensive weapons from last season are still available to head coach MIKE EAVES, the 12th-year bench boss who once was a two-time NCAA (West) First Team All-America selection for the University of Wisconsin before embarking on an eight-year National Hockey League career that was cut short on account of an eye injury. This cast would include senior right wing MICHAEL MERSCH, the fourth round choice (# 110 overall) of the Los Angeles Kings at the 2011 National Hockey League Draft who paced all Badgers last term with both 23 goals and 36 points (in 42 NCAA contests), as well as sophomore center NIC KERDILES, the second round selection (# 36 overall) of the Anaheim Ducks at the 2012 NHL Draft who finished as the second-leading scorer for Wisconsin with 33 points (eleven goals) despite serving a ten-game NCAA suspension to start off the season. After the Badgers’ first ten contests to begin this new campaign, both Mersch (six goals, eleven points) and Kerdiles (five goals, ten points) are again ranked one-two on the scoring chart. Skating at left wing on the top line for Wisconsin with Kerdiles and Mersch so far this season has been Canadian legionnaire MORGAN ZULINICK, the sophomore from Kamloops, British Columbia, who played very sparingly as a freshman on account of injury. The Badgers’ second line is quite capable, too, and is spearheaded by MARK ZENGERLE, the undrafted senior hailing from Rochester, New York, who was the third-leading scorer for Wisconsin last season having totaled 32 points (nine goals) in 36 NCAA games. On the right wing is TAYLOR BARNES, the undrafted senior from Burnsville, Minnesota, who ended the 2012/13 campaign as the Badgers’ second-leading goal-scorer having lit the lamp 15 times in 41 NCAA games. Over on the left wing is JOSEPH LA BATE (41 ga, 9 go, 23 pts), the productive junior also from Burnsville, Minnesota, who was tabbed by the Vancouver Canucks in the fourth round (# 101 overall) of the 2011 NHL Draft. The one great recruiting coup for Wisconsin has been the addition of left wing GRANT BESSE, the 19-year-old freshman from Edina, Minnesota, who was reserved by the Anaheim Ducks in the fifth round (# 147 overall) of the 2013 NHL Draft last summer. 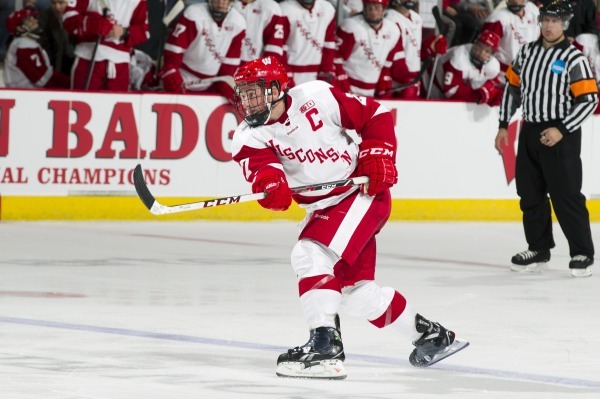 Besse, who was bestowed with the coveted title of “Minnesota Mr. Hockey” last spring after a spectacular prep career (163 goals in 113 games) for Benilde – St. Margaret’s High School, has netted three times in his first nine collegiate contests for the Badgers. Operating at right wing on the third line with Besse has been Canadian legionnaire JEDD SOLEWAY, the good-sized (6’3″ 215 lbs) freshman from Vernon, British Columbia, who was picked by the Phoenix Coyotes in the seventh and final round (# 193 overall) of the 2013 NHL Draft. 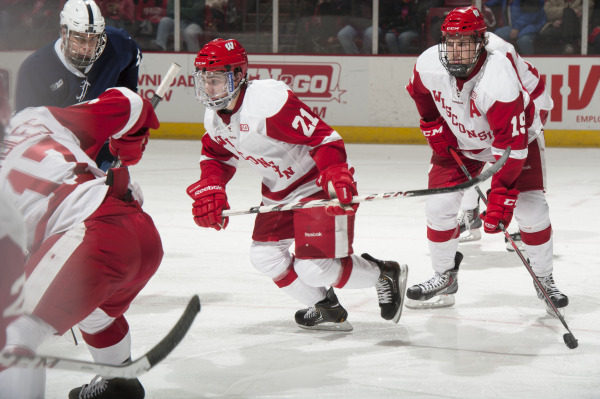 At center for the two bright freshmen prospects has been JEFFERSON DAHL, the homegrown senior from Eau Claire who scored seven goals and added a symmetrical seven assists after appearing in all 42 NCAA games for Wisconsin last season. The list of reliable players at the disposal of the Badgers head coach Eaves hardly ends there. Still yet another legitimate professional prospect who is also an experienced regular in the Wisconsin line-up would be fourth line winger BRAD NAVIN, the homegrown junior from Waupaca who was grabbed by the Buffalo Sabres in the last round (# 197 overall) of the 2011 NHL Draft. The one offensive player who did bolt the Badgers early for the professional ranks was left wing BRENDAN WOODS, the native of Palmyra, Pennsylvania, who notched five goals and seven assists in 41 NCAA games as a sophomore for Wisconsin before joining the Charlotte Checkers of the American Hockey League at the conclusion of the collegiate campaign last spring …… the now 21-year-old Woods had been a fifth round (# 129 overall) choice of the Carolina Hurricanes at the 2012 NHL Draft. Wisconsin center JEFFERSON DAHL (14) shields the puck from Penn State right wing GEORGE STEINOUR (21) during the very first ever, albeit unofficial, Big Ten Conference series between the host Badgers and the visiting Nittany Lions at the end of last February at the Kohl Center in Madison. 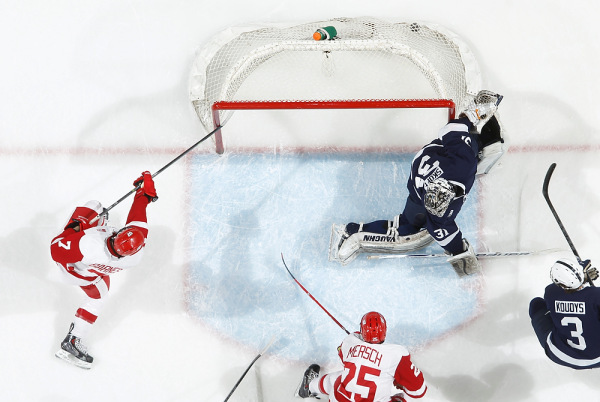 It is the second contest ever played between the UNIVERSITY of WISCONSIN and the PENNSYLVANIA STATE UNIVERSITY that will forever stand out as the signature moment from the Nittany Lions’ debut campaign of Division I-A men’s college ice hockey. To read the rest of the landmark match report written by this blog and quoted above, please reference the article entitled “PENN STATE 3 – WISCONSIN 2″ from the archives available here. 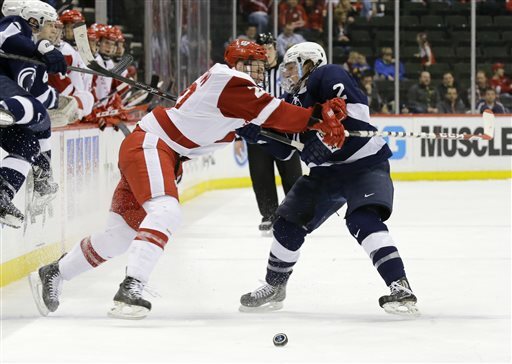 The Nittany Lions, of course, bowed to the Badgers in the very first men’s college ice hockey game ever staged between the two Big Ten Conference schools. However, that particular contest was, in fact, much closer than the actual final scoreline, itself, reflected. To review the detailed match report of the inaugural meeting that is on offer here, please reference the article entitled “WISCONSIN 5 – PENN STATE 0″. Penn State left wing CASEY BAILEY (18), the freshman from Anchorage, Alaska, who ended the noteworthy 2012/13 season as the very first player in school history to ever lead the Nittany Lions’ NCAA varsity in both goals and overall scoring (27 ga, 14 go, 13 as, 27 pts), raises his stick to signal his third period power play tally against host Wisconsin, which knotted the memorable match with the six-time national champion Badgers and set the stage for teammate Taylor Holstrom’s dramatic overtime winner, at the Kohl Center in Madison last February. After conceding a relatively early first period goal to its fierce arch-rival from right next door, the number one ranked team in all the land effectively bore down hard to play a disciplined brand of relentless, attacking hockey as the proud MINNESOTA GOLDEN GOPHERS simply stifled the visting WISCONSIN BADERS 4-1 in the first official Big Ten Conference men’s ice hockey match to ever have the puck dropped. The red-shirted Badgers, who came into this historic contest rated # 12 in the USCHO.com poll and # 13 according to the USA Today/USA Hockey rankings, jumped out in front after six and a half minutes when Land of 10,000 Lakes native JOSEPH LABATE, the junior left wing from Burnsville who was chosen by the Vancouver Canucks in the fourth round (# 101 overall) of the 2011 National Hockey League Draft, found the back of the net at the Mariucci Arena in Minneapolis. Wisconsin have never done well on their travels to the Twin Cities, however, and it would take the Golden Gophers less than three minutes to get themselves back on level terms thanks to a power play strike from defenseman MIKE REILLY, the sophomore from Chanhassen who was grabbed in the fourth round (# 98 overall) of the 2011 NHL Draft by the Columbus Blue Jackets. Less than four minutes thereafter, right wing SETH AMBROZ, the junior from New Prague who was tabbed by the very same Columbus Blue Jackets in the fifth round (# 128 overall) of the very same 2011 NHL Draft, sent Minnesota ahead to stay by using Wisconsin goaltender LANDON PETERSON as a backboard while actually stationed behind the net. For all its hard work to limit the punchless Badgers to just four second period shots-on-goal, the Golden Gophers remained at risk until redshirt freshman right wing CONNOR REILLY, the undrafted, younger brother of the Minnesota defenseman who had scored earlier in the contest, stepped forth to light the lamp with a little more than nine minutes left in the third period. Reilly, who was promoted to the second line as a result injury to TAYLOR CAMMARATA (12 ga, 3 go, 11 pts), the talented freshman who was the third round selection (# 76 overall) of the New York Islanders at the 2013 NHL Draft, did rather well to fake a pass and realign his angle before beating the Wisconsin goaltender Peterson. The ambitious Ambroz, meanwhile, finished off the hapless visitors (whose all-time away record opposite the University of Minnesota now drops to an unsightly 27 wins against 92 losses with eight ties) and guaranteed his name will live on forever in the annals of Big Ten Conference ice hockey history by shooting into an empty net and scoring his second goal of the evening on this most momentous occasion. University of Minnesota right wing SETH AMBROZ raises his stick after scoring the first of his two goals against the visiting University of Wisconsin that gave the hosting Golden Gophers a first period lead which would never be relinquished during the history-making Big Ten Conference ice hockey match at the Mariucci Arena in Minneapolis. University of Minnesota goaltender ADAM WILCOX (32), the sophomore from South St. Paul who was the sixth round selection (# 178 overall) of the Tampa Bay Lightning at the 2011 NHL Draft but was yanked by Golden Gophers head coach Don Lucia his last time out after conceding five times in 35 minutes versus the traditional intra-state rival University of Minnesota-Duluth Bulldogs, makes the save to disappoint University of Wisconsin defenseman JAKE MCCABE (19), the offenisve-minded junior from Eau Claire, who was the second round choice (# 44 overall) of the Buffalo Sabres at the 2012 NHL Draft, during the very first Big Ten Conference ice hockey game ever contested at the Mariucci Arena in Minneapolis, Minneapolis. Wisconsin center MARK ZENGERLE (9), the undrafted junior from Rochester, New York, who finished as the third-leading scorer with 32 points (nine goals) for the Badgers this season, is harassed by UMass – Lowell defenseman CHAD RUHWEDEL (3), the undrafted junior by way of San Diego, California, and the Sioux Falls Stampede of the United States Hockey League, while River Hawks right wing JOSH HOLMSTROM (12), the junior from Colorado Springs, Colorado, who also skated with Sioux Falls in the USHL, chases from behind during the Northeast Regional semifinal contest watched by 8,049 spectators at the Verizon Wireless Arena in Manchester, New Hampshire. A relatively early goal against the run of play in the first period and two more unanswered strikes in the second session combined with continued good form from the standout freshman netminder to propel the # 3 ranked UNIVERSITY OF MASSACHUSETTS – LOWELL to a decisive 6-1 triumph over six-time NCAA champion WISCONSIN on the opening day of the 2013 NCAA men’s ice hockey tournament. UMass – Lowell goaltender CONNOR HELLEBUYCK, the newcomer who was chosen in the fifth round (# 130 overall) of the 2012 National Hockey League Draft last summer, stopped 31 of 32 Wisconsin shots to pick up right where he left off after winning the Most Valuable Player award at the 2013 Hockey East post-season tournament. The 19-year-old from Commerce, Michigan, has won eighteen of his last nineteen starts since taking over as the number one netminder for the River Hawks. Hellebuyck has been particularly sharp for streaking UMass – Lowell as of late, halting 100 of 102 shots faced in the River Hawks’ last three games against Providence College, Boston University as well as Wisconsin. 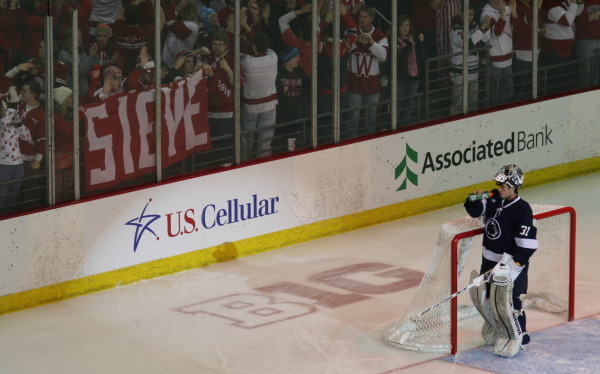 Hellebuyck pulled off a signature save for the evening with just a little less than four minutes remaining until the first intermission after Wisconsin center JEFFERSON DAHL, the homegrown junior from Eau Claire who scored seven goals in 42 games for the Badgers on this 2012/13 campaign, had been hauled down from behind and awarded a penalty shot. UMass – Lowell, who also qualified for the Sweet Sixteen On Ice last season but are still only appearing in the annual NCAA tournament for the fifth time in school history, stormed to the lead after JOSEPH PENDENZA, the homegrown junior from Wilmington, raced down the left wing and whipped a wrist shot past Wisconsin backstop JOEL RUMPEL to the far side with little more than seven minutes having been played. The Badgers went on to outshoot the River Hawks 11-4 in the first twenty minutes but, on the heels of Hellebuyck’s late first period heroics, the River Hawks quickly grabbed a second goal just 3:12 into the second session at the Verizon Wireless Arena in Manchester after Swedish import CHRISTIAN FOLIN, the freshman defenseman from Gothenburg, worked a smooth give-and-go with Canadian legionnaire SCOTT WILSON, the sophomore left wing from Oakville, Ontario, who was a seventh round pick of the Pittsburgh Penguins (# 209 overall) at the 2011 NHL Draft and currently leads UMass – Lowell with 16 goals this season. Badgers defenseman JOE FAUST (24), the seasoned junior from Bloomington, Minnesota, who was selected in the fourth round (# 114 overall) of the 2010 National Hockey League Draft by the New Jersey Devils, cannot prevent UMass – Lowell’s Canadian legionnaire SHAYNE THOMPSON (7), the hard-working junior left wing from Brockville, Ontario, from slipping the puck past Wisconsin’s Canadian legionnaire netminder JOEL RUMPEL (33), the undrafted sophomore from Swift Current, Saskatchewan, with time running out in the second period of the NCAA men’s ice hockey tournament Northeast Regional semifinal contest in Manchester, New Hampshire. UMass – Lowell established what turned out to be a death-grip on the game after Canadian legionnaire SHAYNE THOMPSON got in behind the Wisconsin defense to collect a home run pass from River Hawks rearguard JAKE SUTER, the sophomore who hails from Flambeau, Wisconsin, just before reaching the Badgers blue line; a third goal of this season from the traditionally low-scoring junior left wing, who has now netted exactly eight goals in three years with UMass – Lowell, at the 14:08 mark of the second period left Wisconsin deep in a 3-0 hole. Wisconsin finally got on the scoreboard more than forty-eight minutes into this NCAA tournament fixture after in-form freshman left wing NIC KERDILES, the native Californian who was the second round choice (# 36 overall) of the Anaheim Ducks at the 2012 NHL Draft last summer and the MVP of the WCHA’s Frozen Five tournament this season, netted with the man-advantage. It should be noted that the Badgers never did get much of a contribution in the post-season playoffs from junior right wing MICHAEL MERSCH, the junior who led the Big Ten this season by scoring 22 goals in 36 regular season games for Wisconsin, however. 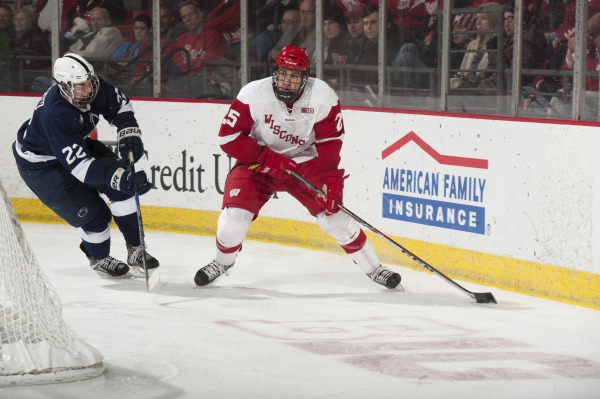 The closely-watched Mersch managed to tally just one goal in six playoff contests for the Badgers this spring. 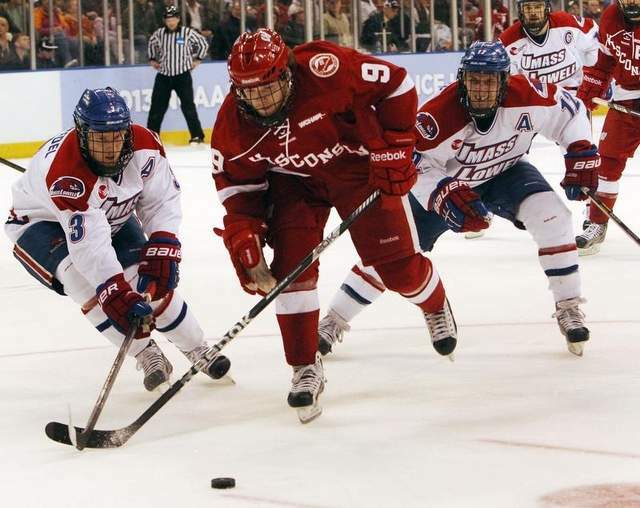 UMass – Lowell, who improved its record this term to 27 wins against 10 losses with two ties, might have responded by adopting ultra-defensive tactics in an effort to effectively kill off the remainder of the game with Wisconsin. Instead, however, the enterprising River Hawks retaliated for the lost shutout by shooting three more goals in the final six minutes of play. Right wing DEREK ARNOLD, the homegrown junior from Foxboro who scored UMass – Lowell’s only goal in the 2013 Hockey East tournament final against Boston University, worked a one-two with left wing RYAN MCGRATH, the 21-year-old freshman from O’Fallon, Missouri, and stretched the Red Hawks’ margin to 4-1 at the 13:56 mark of the third period. Wisconsin, who ended its 2012/13 campaign with a final slate of 22 wins against 13 losses with seven ties, made one last ditch attempt at a comeback and, accordingly, lifted its Canadian legionnaire netminder JOEL RUMPEL in the waning moments. This development only enabled UMass – Lowell fourth line right wing ADAM CHAPIE, the 21-year-old freshman from Oxford, Michigan, to amass his sixth goal of the season via an empty net strike. The explosive Red Hawks also tacked on a power play goal by McGrath with just three seconds remaining after Wisconsin center BRANDON WOODS, the sophomore who was selected by the Carolina Hurricanes in the fifth round (# 129 overall) of the 2012 NHL Draft last summer, had gone off for roughing. UMass – Lowell goaltender CONNOR HELLEBUYCK (31) prepares to deal with the backhand effort from Wisconsin right wing MICHAEL MERSCH (25), the junior from Park Grove, Illinois, who was the fourth round pick of the reigning Stanley Cup champion Los Angeles Kings at the 2010 NHL Draft, as Badgers left wing JOSEPH LABATE (16), the sophomore from Eagan, Minnesota, who was tabbed in the fourth round (# 101 overall) of the 2011 NHL Draft by the Vancouver Canucks, hopes for a rebound during the opening round match of the 2013 NCAA tournament at the Verizon Wireless Center in New England. Notes — University of Massachusetts – Lowell River Hawks, the first-time Hockey East playoff champion this term, had only two of its three National Hockey League draft choices suited up for its opening contest at the 2013 NCAA men’s ice hockey tournament as compared to the nine NHL draft picks who were in uniform for the Wisconsin Badgers.